The international bestseller takes you on a fast-paced, nail-biting thrill ride from the Great Pyramids in Cairo, to behind the Nazi lines in Berlin, to the very seat of democracy as our hero tries to unravel a plot that could kill FDR and Winston Churchill. November 1943: Adolf Hitler sanctioned his most audacious mission ever—to kill US President Franklin D. Roosevelt and Prime Minister Winston Churchill while they visit Cairo for a secret conference to plan the Allied invasion of Europe, an invasion which threatens imminent defeat for Germany. Only one man is capable of leading the defiant Nazi mission—Major Johann Halder, one of the Abwehr’s most brilliant and daring agents. He is a man with a tortured soul and a talent for the impossible. Accompanied by an expert undercover team and Rachael Stern, the young and beautiful Egyptologist, Halder must race against time across a hostile desert to reach Cairo and successfully complete the assignment, or else forfeit his life and the life of his son. When US military intelligence hears about the plan, they assign Lieutenant-Colonel Harry Weaver, one of their best officers, to hunt down and eliminate Halder and his team. But for Weaver, as well as for Halder and Stern, there’s more than the balance of war and the lives of the Allied leaders at stake—a pact of love and friendship will be tested in the frantic, high-stakes chase to the death. 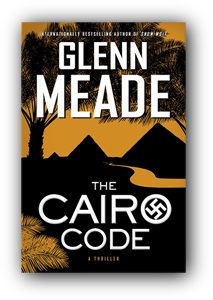 Based on a real attempt to kill the President, The Cairo Code is a breathless, suspenseful thriller—a heart-wrenching tale of friendship, love, and treachery set against the exotic and intriguing backdrop of wartime Egypt. "Meade weaves well-developed characters into a complex plot that moves at a brisk pace. His vivid descriptions of the sights and sounds of Egypt made me feel like I was back at Sakkara." " A non-stop World War II thriller that will prove much enjoyment to fans of the sub-genre. The story line uses authentic events, which enhance the speed of the novel... Glenn Meade is quickly attaining a reputation for historical thrillers.” "